Designed To Fit All Standard Sizes. When It Comes To Truck Seals We Have All 53 Feet Sealed Up! As the leading manufacturer of extruded profiles for trucks and trailers, Advanced Plastic has sealed up the transportation industry. Our transportation products have been used extensively by the largest and most prestigious U.S. truck and trailer manufacturers since we entered this market over 30 years ago. 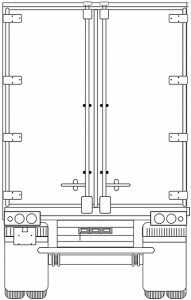 Our story begins in the 80s when Met-L-Wood challenged us to transform a standard swing door trailer gasket. This challenge led to the creation of the dual durometer PVC seal, which is still widely used in the industry. Advanced Plastic has built on this success, leveraging in-house tooling and strong customer relationships to develop innovative products and value-added solutions to the truck trailer industry. With decades of experience catering to the transportation industry, we’ve worked with virtually every material used in the manufacturing of weather seals, gaskets, liners, conduits, moldings, insulators, and jambs. This expertise translates into the selection of the most appropriate material for the task at hand. Whether an application requires thermal insulation, sound dampening, rigidity, flexibility, or extreme durability (or a blend of various characteristics), our engineers know exactly which materials to use. Our custom tooling expertise enables us produce durable plastic extruded profiles unique to each manufacturer’s project requirements. We work closely with design engineers, accepting their technological challenges and delivering innovative truck trailer seals that meet all form and function specifications. We welcome the opportunity to work with engineers to turn design complications and new concepts into custom plastic profile solutions. gaskets with a diverse group of products spanning the entire length and width of the trailer. If you need help sealing up your trailer we are happy to be of assistance. Contact us at 847-674-2070.